Good morning children! Today, we're going to talk about how to use an 1176. I know what you're thinking: what can this guy tell me that my mother didn't tell me when I was growing up? You know, those little pieces of advice she peppered here and there, like "Blow your nose", "Say hi to the lady", "Don't overuse the All Button Mode". But you never know, she might have missed something. Check it out! Why has the 1176 been so popular since the 60s, when the mighty Bill Putnam unleashed it on us lonely humans? Good question! I think it's 3 things. A, it has a very particular tone, and a very useful tone. 2, it's very versatile, you can make it do just about anything if you know how. And 3, it's easy to use: it only has 4 knobs and 4 buttons. As a musician, you expect it to know how to count to 4. That makes a good match. The first knob we're going to look at is the Input knob. The 1176 does not have a Threshold knob. It's a fixed Threshold Compressor. When you have a Threshold knob on a different kind of Compressor, you bring the Threshold down to meet the signal. On the 1176, you use the Input knob to bring the signal up to meet the Threshold. It's the other way round. The second knob is the Output knob. It's a classic Make-Up Gain knob, which we need, since we're gonna grossly overcompress everything with this little sucker. Once you're mostly happy with your compression setting, but maybe wanna play around with it a little more, a little less, you can do that at constant level by doing this: use both the Input and the Output knobs at the same time, like this. We know if we want more compression, we've got to raise the Input. But we want constant level, so we're gonna lower the Output, and do this. I'm raising the Input and lowering the Output at the same time. Basically, I'm heightening the compression, but keeping the Output gain at the same level. If this is too much compression, I just wanna ease up, I just do this: I lower the Input, but I compensate by raising the Output. Now, basically, this is it: more compression, less compression. More compression, less compression. Do you like it? Next, Attack and Release knobs. We know what they do. The 1176 Attack can be very, very fast, down to a microsecond range, which is great for drums and stuff like that. If you want it to be very fast, turn it up to 7. It makes sense. No, it doesn't make sense! But that's the way it is. 7 is the fastest, 1 is the slowest. Same for Release, 7 is the fastest, 1 is the slowest. You will make that mistake, we all make that mistake. That's it for the knobs, let's talk about buttons. There are 4 Ratio buttons: 4, 8, 12 and 20:1. The trick about the 1176 is that the supposedly fixed Threshold actually varies with the Ratio. So, the Threshold at 4:1 is lower than the Threshold at 20:1, meaning, you're gonna have to hit the machine harder to hit the Threshold when you go in 20:1. That makes sense, right? Yes it does! Now, it's not that big of a difference, but you'll hear it and feel it when you start using it. As for the All Button Mode, you might want to try and push in all buttons at the same time. It might work. For the lazy people amongst us, you can just use the 4 and 20 at the same time. It works too, and it's arguably easier. There's not 4 buttons, there's 8. I was trying to make a point. But the 4 buttons on the right here are either Meter-related, and I suggest you have the Gain Reduction engaged at all times, or the Off button, which I will not explain. We know enough to be dangerous, let's make some music! Let me show you some example on how to use the 1176 in real life. First, let's try and set it up as a Compressor-Leveler kind of thing, on a bass for example. Listen to the part, and memorize the sound. Those things... Check it out. It's funky, and that's great, but I also need it to be solid, because it's the middle, and the anchor of the bottom of the track. So I'm gonna compress it with the 1176. Now, what are my startup settings? I know I want to level, I know I want to compress. So I'm gonna choose a Ratio of 4:1. I may switch to 8:1 if that's not enough, but 4:1 should be a good start. I do not want to alter the sound of the bass, I just want it to be more even. So I'm gonna open the Attack all the way. Remember, if you open, you go down to 1. I'm also gonna open the Release all the way, so once it starts compressing, it'll stay in compression for a long time. There will be no pumping, it's just gonna be a solid block of sound. As for the levels, I have my Input at 10am, and my Output at 2pm. That's the basic setting. If the track is properly recorded, and your session is properly gain-staged, this should work. It doesn't always happen, but I recorded this one, so it should work. Let's listen to it. Despite the level difference, the compressor is already doing his job. We've got ways to go, but it's pretty good. I think that we can compress more. So if you remember, I'm gonna get harder into the Compressor and lower the Output a little bit. Maybe a little more Output gain. Maybe a little more compression! So I'm gonna go from 4:1 to 8:1. Let's compare with the original. We have a much more even sound. And it doesn't sound compressed, or not too compressed. Now, that... thing kind of bothers me, so what can I do about that? I guess I could shorten the Attack to, say 4. That way, that little transient will get caught on the third note. It's a little more tamed, but it's more even, it'll be a lot easier to mix in the track with the bass drum, and the rest of the stuff. Next, I'd like to show you how to use the 1176 as a Peak Limiter, for example on a vocal. How to get rid of those annoying hits, that get into your eyes when you listen to the vocal. It's very simple. I know I'm limiting, so I'm gonna go to 20:1. I'm gonna start at my basic stuff. I know I wanna catch those peaks, so I'm probably gonna have a short Attack, up to 7, and a short Release. All I want to do is just go... "Poum! ", whenever the peaks are going over the Threshold. So let's listen to the track. First, let's listen to the clean signal. Here we go. There's a lot of plosives. Try and listen again to all those peaks that kind of ruin the experience of listening to him sing. Check it out. It's very peaky. So let's insert the 1176 on this track, and see what the basic settings I just chose do. I think it could use a tiny bit more, a smidgeon more compression, especially for the last "Business". I would get a more blocky kind of sound, a more in your face sound. It's a little too quiet, I'm gonna give it a little more gain. It does a good job at the "Business", and the "Get Down", it's pretty nice. What I think is happening is that the Release is so fast, that the 1176 is pumping a little bit. So I'm gonna slow the Release down, and see what that does. And then I'm gonna take it down to 4. That works! Again. Very short Release. And then with a slower Release. Nice! As a reminder, we started here. I like that. That's a good basis to sweeten the track. One of my favorite things about the 1176 is that it's great at giving punch to tracks that deserve it, like for example bass drums, check this out! This is a raw bass drum. It sounds good, but it could use more punch. The principle is as such. Say you compress the bass drum, but you open the attack, you're gonna let the attack through, and the rest of the body of the bass drum is gonna get compressed, meaning that the attack is gonna be louder, in relation to the body, than it was before. More attack, more punch. Let's try. I'm gonna turn the 1176 on and listen to it with my basic settings: 4:1, middle Attack, middle Release, 10 and 2. Here we go! That's not working. First, I don't think I'm compressing enough. I think that the attack is still too closed, and catching too much of the transient. The Gain Make-up is too low, so I'm not matching my levels. So I'm gonna address all that stuff in one pass. Focus on the bottom of the bass drum. I'm gonna play it raw again. Listen to how low it goes, and how much rumble there is on it. Then listen to it again with the compressor, and focus on that part, the very, very bottom of the bass drum. It's tighter, right? The bottom goes up a little bit. So much tone that you can actually use the 1176 as a tone shaper, without compression. Let me show you. I'm gonna switch to 20:1 Ratio, which is essentially a limiting Ratio. Basically, I'm using the highest Ratio, so I can have the highest Threshold, so I can not get any compression. I'm gonna wide open the Attack so that it's very slow getting into it, and then make a very short Release, so if something happens, it's really gonna be very small. And I'm gonna lower the Input all the way down to the highest maximum level before compression. So, this is raw. Listen to the tone of the bass drum raw. And now, with the 1176. No compression, just passing through the box. Isn't that cool? Check out the bottom, check out the presence, check out the shape of the bass drum. Does it do this? Or does it do this? Check it out. And that's no compression! Just the color of the box. Almost like an EQ, but without EQ'ing. The bass drum no longer has that flabby thing in the bottom, it's kind of tight, and one piece, a solid piece of sound. So you can get more attack, and more punch, by opening the Attack on the 1176, and compressing more, or you can just not compress at all, and use the tone of the box to shape the bottom of your track. It's very practical. Next, let's look at it, when you abuse it. It's very useful for effects, or for parallel compression, or for whacky stuff, like for example, listen to this snare drum. I'm a trained professional, don't try this at home! There you go. It sounds like this with our basic settings. Turn it on... Boom! Obviously, I've got to hit it harder. Here we go. It's starting to sound interesting. If you play with the Attack and the Release, that's where it gets real fun. The box is freaking out, but the principles are the same. If you shorten the Attack, you're killing the transient. If you lenghten the Release, you're gonna keep it together. Then if you open the Attack and shorten the Release, it's gonna go "Crounch!" 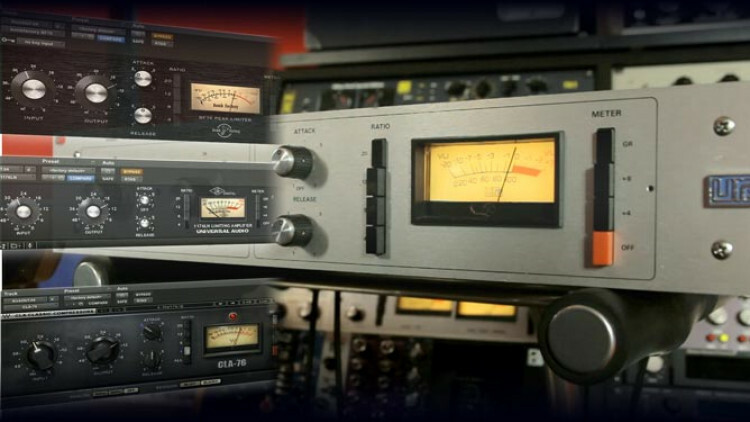 Like all superstars, the 1176 has been much imitated, and, sign of the times, turned into plug-ins. I thought it would be fun to take the settings we liked earlier on the bass drum, and apply them to 3 different kinds of plug-in emulations of the 1176. So first, the actual box. I turn that off. Now, the Bomb Factory BF76. Ok. Now, the UA 1176LN. Ok. And now, the CLA-76 from Waves. Those are the same settings. What's going on? They all sound different. Different levels, different everything. First, I have a Rev H 1176 that does not have the transformer inputs. Those are all Rev D, or E models, I suppose. That said, it should basically be in the ballpark. The lesson here is: don't assume that all the settings are gonna match from plug-in to plug-in. It never works that way. Since I'm a masochist, I decided to take an hour and try and match the sound, not the settings. As you can see, the settings no longer match. As far as the tone goes, this is what I could come up with, in my current state of mind. This is the original. Different, right? This is the 1176LN from UA. And this is the CLA-76. They're in the ballpark, but they all have different colors. Listen to the bottom: low-end extension, or high-pass, the presence, forward to back, and the shine, the aggressivity of it all. So let's start with the original. The reality is that I have never heard two 1176s sound quite the same. Different original machines are being modeled, the designers have different views, they have done it at different times, ultimately, it's up to your taste. The box is very versatile, it's worth learning it. And I have one last piece of advice: don't ever forget what your mother said! Et voilà! I thought I had a handle on the 1176, but Fab never fails to deliver more insight. Thank you, Fab! Wow this is one of my favorite tutorials. Now I can master the cubase 1176 and also the native instruments 1176. A fantastic tutorial for (finally) understanding the Voodoo of this machine! Thank you so much! The plugin comparison is not useful. Even comparing different hardware units will produce the same results because no two units sound the same. Check this out: https://www.youtube.com/watch?v=Ngtw0eEcgls Otherwise, good stuff as always. Thank you very much, I finally have a significantly deeper understanding of this multitool. Thank you, thank you, thank you. Well done - thanks for explaining everything in way that makes sense, and using audio examples that fit the lesson. I really got a lot out of this, thank you! Really appreciate the in depth explanation of the 76. Not to start a ratings war, but does anyone have a comment on which 1176 plug-in is best? On first listening, the Waves plug-in sounds really good to me. Woww Fab thanks!!! great video. Hey Fab , best explanation ever on how to use a studio staple , not stapler. ... I forgot to say thank you for this very very useful video!!! Newbie question! What to do if I have only one 1176 but I want to use it in different tracks! Adjusting and printing track by track! Or would this be nonsense? Hey Fab! I never really knew how to set the threshold in relation with ratio! When should I stop lowering the threshold, and when should I start raising the ratio? Can you give me a light? Informative and entertaining, great stuff! This tutorial is excellent. With regards to various ATTACK and RELEASE settings, I got confused at first when you used the words "fast", "short" and "closed" interchangeably to refer to the same thing VERSUS "slow", "long" and "open". It made my head hurt, and I had to rewind a lot, but I think I got it now. this guy knows his sh*t!!! Formidable !!! I've (only) all three plugins 1176 and the new UA 1176 collection: now I'll try to match your 10 - 2 basic configuration with my mixes. Thank you! Thank you! 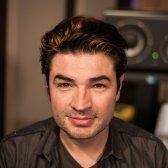 You are consistently the best teacher on the net for all things mixing and audio!! More than any particular application I get out of these videos the instruction on how to listen goes through all them is the best! Thanks.